"Map pinpointing Pugwash, Nova Scotia from various locations in the world"
On March 1, 1954, a U.S. hydrogen bomb (H-bomb) was detonated at Bikini Atoll, exposing fisherman on the nearby Japanese boat, Daigo Fukuryu Maru (Lucky Dragon No. 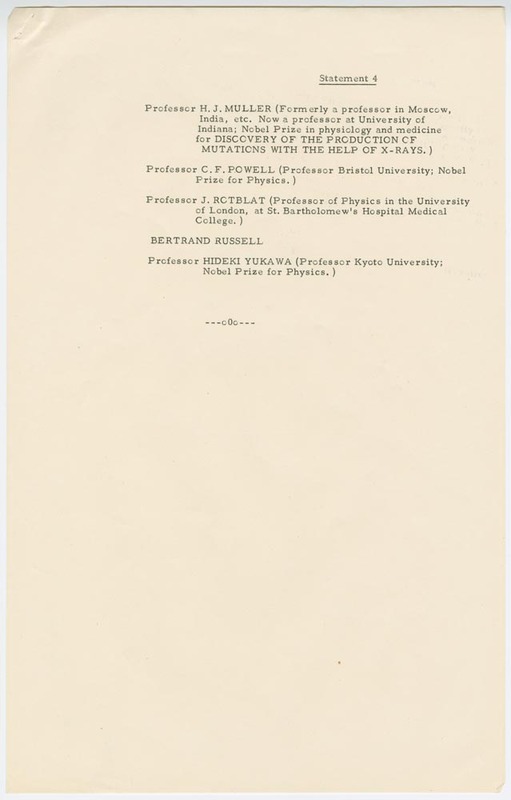 5), to radioactive fallout. "They were outdoors, on this little boat when the bomb went off. Several hours later, the radioactive debris of a chalky nature—the coral was made of chalk. This drifted down and descended on the decks of the Lucky Dragon. The men took it off their shoulders and off their heads. They were very lucky; the Lucky Dragon had a good name. They were very lucky because if the bomb had been bigger, there would have been more radioactivity and it would have killed them. As it was, it did not. Only one man died, and I think he died of a blood disease." 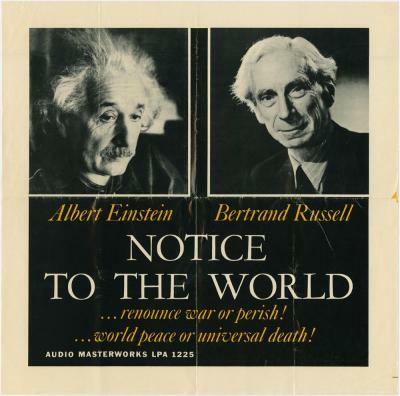 Bertrand Russell, a British mathematician and philosopher, was on Panorama​ with Rotblat, and they passionately discussed the impact of nuclear weapons. 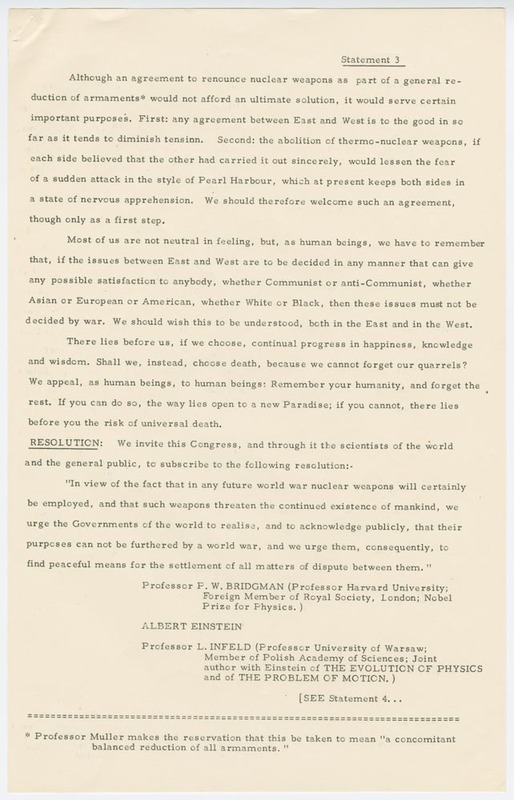 Both believed nuclear weapons were a severe danger to mankind. 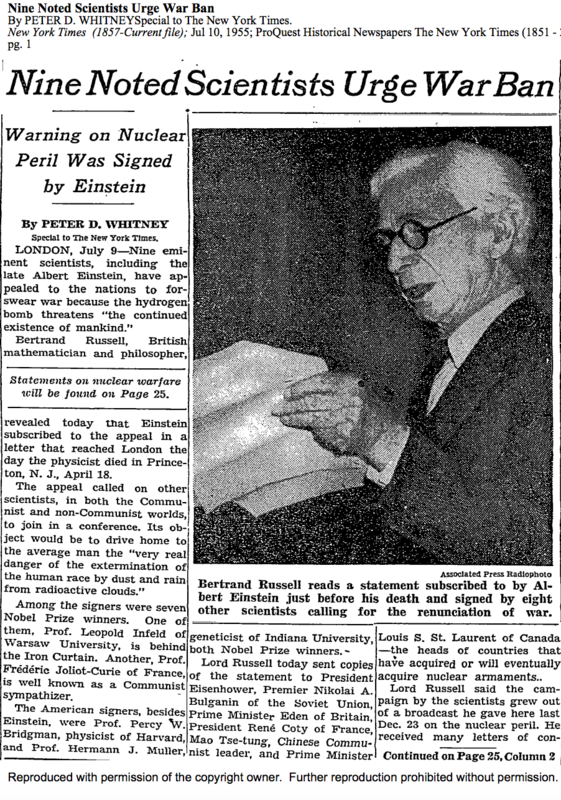 Rotblat became essential to executing Russell’s vision of a conference of scientists to discuss nuclear warfare. 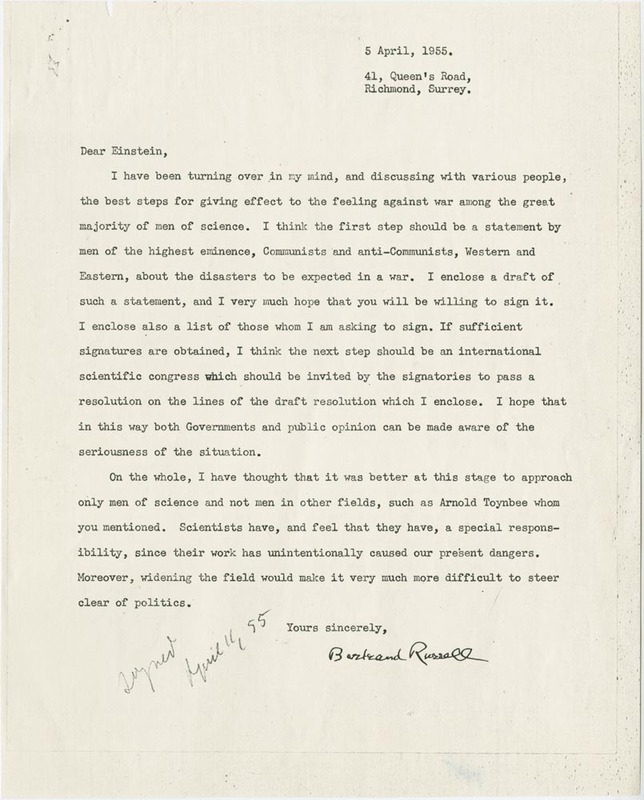 "Rotblat's appearance on Panorama, 1954"
Russell created a declaration that proposed the gathering of scientists to discuss nuclear warfare and efforts to eliminate it. 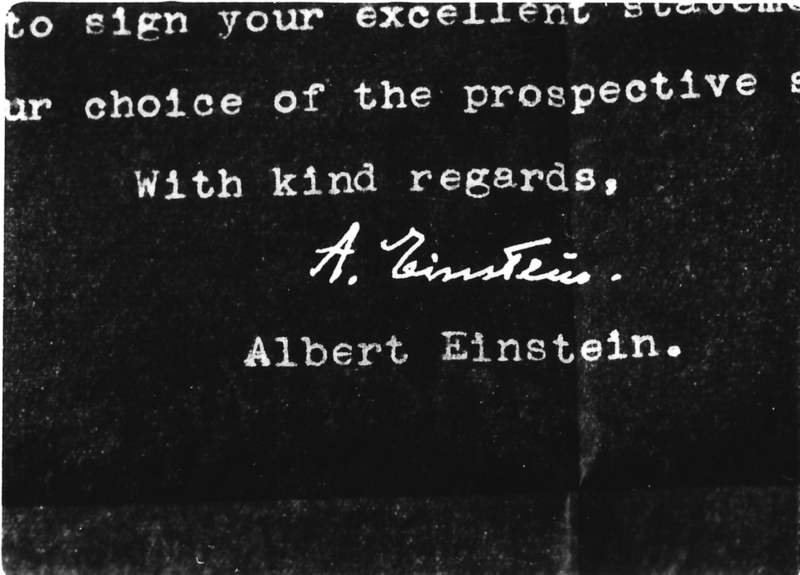 The scientists would be asked to set aside their political backgrounds and unite “as members of a biological species which has had a remarkable history, and whose disappearance none of us can desire.” This text, endorsed by Albert Einstein in a letter two days before his death, was titled the Russell-Einstein Manifesto. 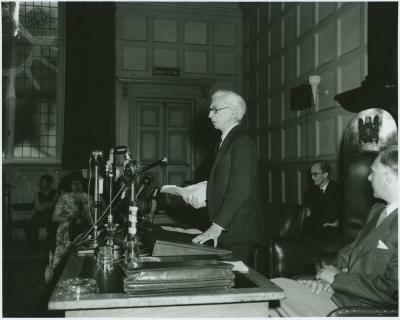 It was announced in London’s Caxton Hall at a public meeting chaired by Rotblat, a signer of the document. 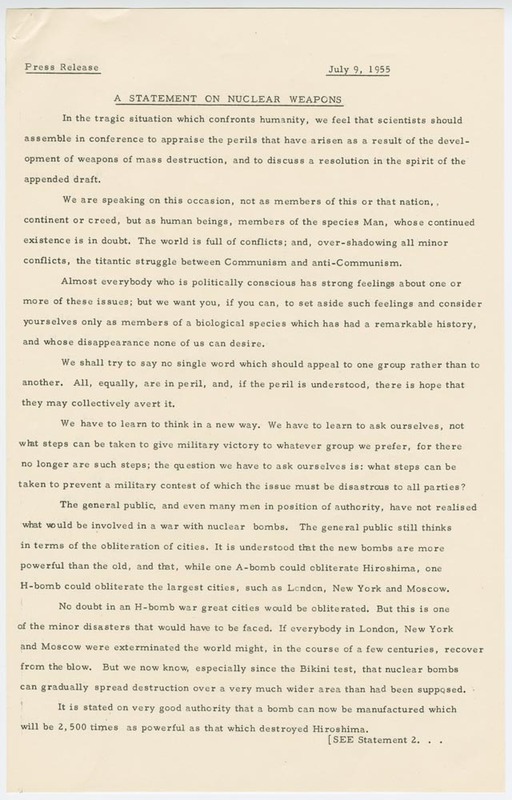 "To those of us in Chicago [the Manifesto] was like finding a crack in the Iron Curtain. 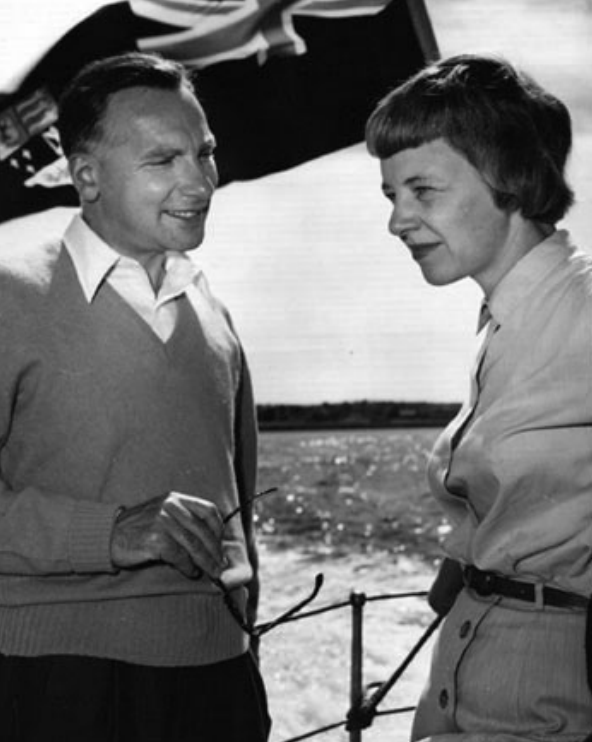 Especially to me, and to many of those in my generation in that setting, it gave meaning and set a principled direction that we could follow with enthusiasm." 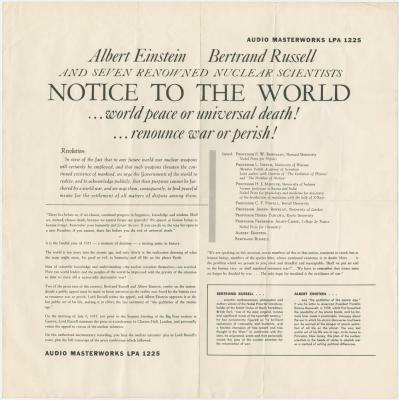 ​The Manifesto gained worldwide attention from the press, scientists, government officials, and world leaders. 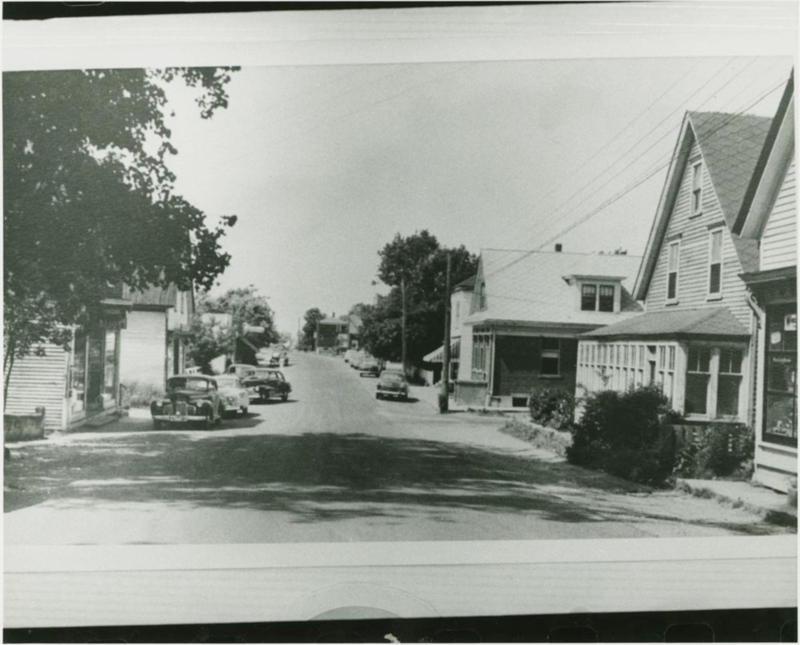 Canadian industrialist and financier, Cyrus Eaton, financed the conference of scientists, requesting that the first one be in his birth village, Pugwash, Nova Scotia. ​Twenty-two delegates attended the first Pugwash Conference representing countries such as the U.S., the Soviet Union, and China. 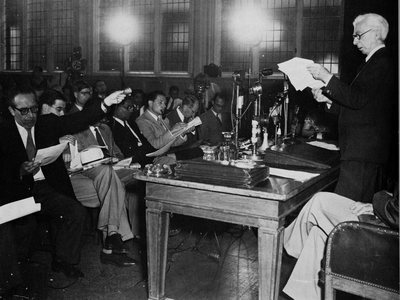 During the four-day meeting, participants discussed radiation hazards, international control of nuclear weapons, and the social responsibility of scientists. 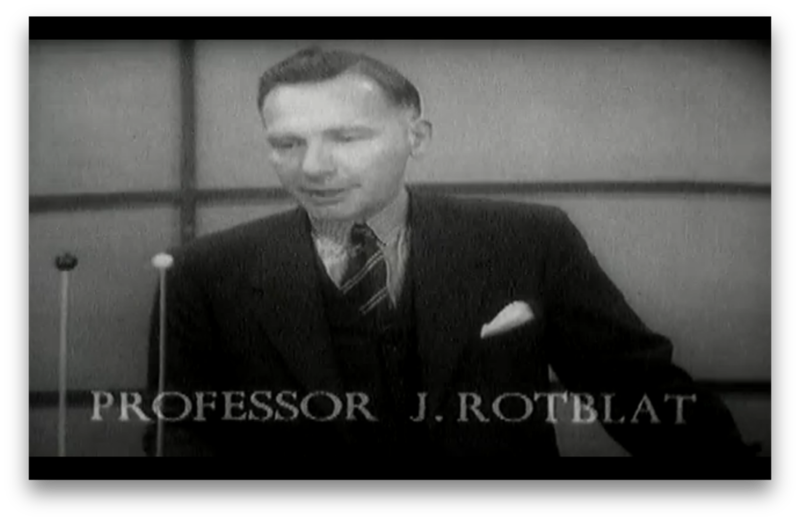 At the Conference’s end, Rotblat read three reports to the press and sent copies to leaders of countries with nuclear weaponry. 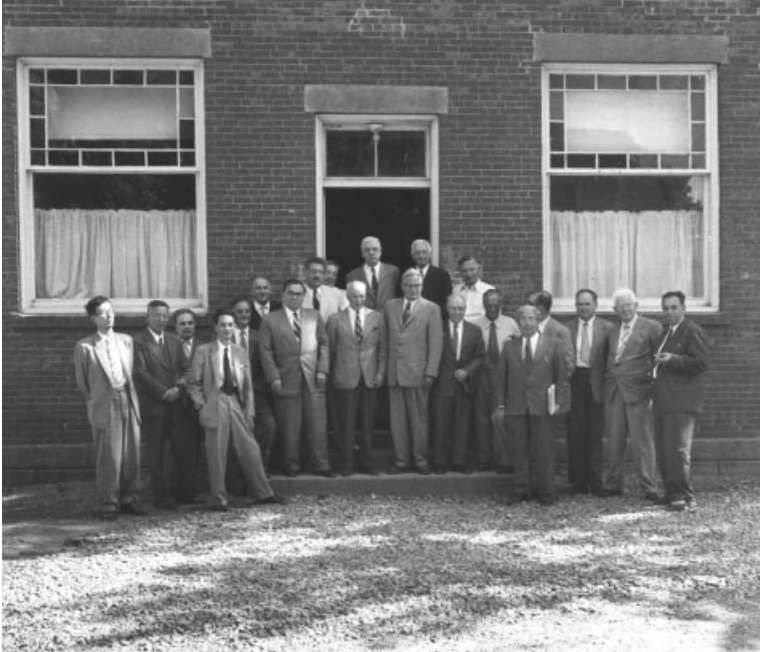 "1st Pugwash Conference, Pugwash, Nova Scotia, July 1957." 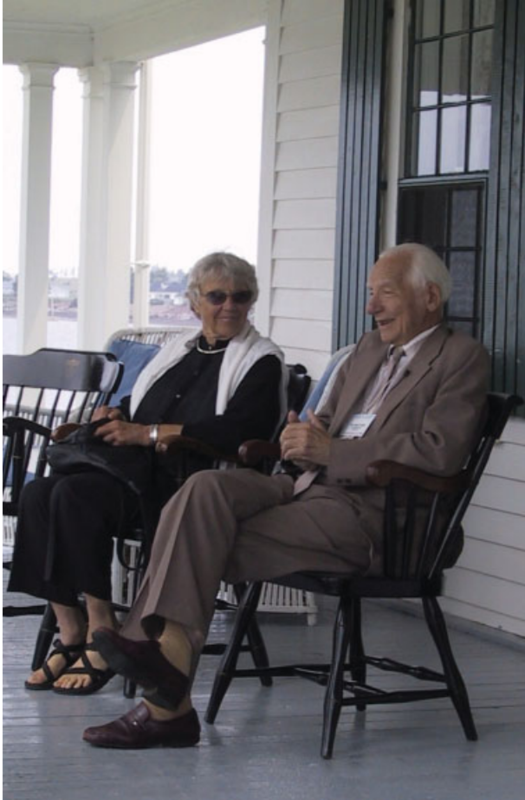 "With Ruth Adams, 1st Pugwash Conference, Pugwash, Nova Scotia, July 1957." "On the porch with Ruth Adams, Pugwash, Nova Scotia, 2003."